Have you ever seen those gaudy wood panels that poorly imitate a look of a brick or stone wall? I’ve even run across shingle siding that attempted to display a similar effect. 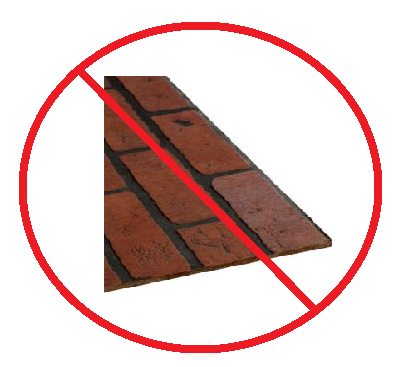 Offering nothing more than an eye sore, faking masonry surfaces with wood or asphalt shingles is just wrong. With advancements in masonry technology and innovative creations and design, creating the appearance of brick or stone has become easier and more affordable than ever with faux stone and brick veneer. What is the real thing? Before the idea of man-making stone veneer, stone would have to be mined at a quarry, cut to size and then installed. Examples of this type of product can be seen far and wide. Odds are, If you have a home or structure less than 30 years old, and it appears to be stone, it’s probably stone veneer. At as low as 1/4 the cost of the “real thing” and with many manufacturers producing equivalents that can be easily mistaken for real stone, it’s the best way to go for new construction and many times can be a nice alternative route for restorative repairs. Side Note: I’ve found that many, myself included, may refer to stone veneer as “Cultured Stone” just as one might say Q-tips rather than cotton swabs. “Cultured Stone” is a trademarked name for a stone veneer product from one of the older manufacturers. What is Faux Brick Aka: Veneer/Thin Brick? Faux brick, much like stone veneer is a thin brick cast from a cement based product, or sometimes fired the same way brick today are made. The difference? 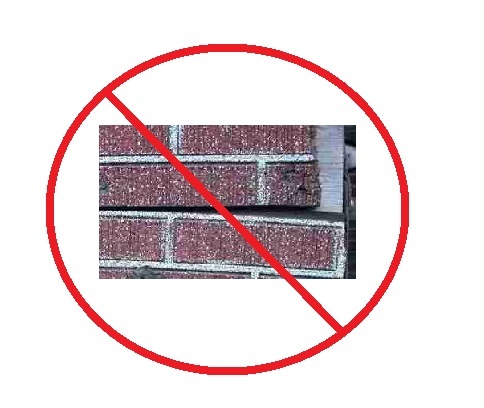 Thin brick, or Faux brick are about 1″ or less thick/deep vs. average brick depth is around 3-4 inches. Building with these man-made products is a much different process than traditional masonry construction. Laid more like a tile for backsplash than brick, block or stone, these artificial materials are set onto a mortar coated wall. Sometimes with the use of wire mesh (Depending on installation instructions via manufacturer) The savings on material is equally matched by the savings of labor costs as stone veneer and faux brick are laid much faster than traditional laying. Putting on a Facade: The Benefits of faking it. Bring a new look to that old porch of yours: Boring, plain, poured concrete porches can be wrapped with stone or thin brick for less than the costs associated with laying natural stone or brick. Faux materials also take up less space. Add a touch of style to your exposed concrete foundation: Wrapping a poured concrete or block foundation with a stone veneer can create the look of a foundation built with old field stone without having the shifting problems associated with real stone foundations. Dramatically enhance curb appeal: Stone and brick veneer pieces can add a kind of “craftsman build appearance” to an otherwise “normal looking” masonry home. Stone accents, and decorative brickwork can be added to any masonry wall around your home. Limited only by your imagination, these faux building materials can achieve any masonry look you desire. Check Out Local Suppliers in St. Louis for more design and material options. Hours: M-F 7a.m.- 4 p.m.
Posted in Brick Construction, Destruction & Reconstruction, St. Louis Tuckpointing & Brick Repair and tagged block, Brick, company, facade, fake, faux, services, St. Louis, stone, thin, veneer on March 18, 2014 by Jacob Thompson.